Tax Time: Are YOU Prepared To Maximize YOUR Refund & Minimize YOUR Taxes? Click the link above for a free webinar hosted by Master Coordinator Ray Madorin, Presidential Master Coordinator Charlene Fike, and tax expert Sandy Botkin, a former IRS Attorney & Senior Tax Law Specialist. Have you ever gotten any of these reactions from friends, family or prospects when you’ve invited them to just take a look?
. . . Is this one of those pyramid deals?
. . . I know someone who didn’t make any money at that.
. . . I’m not a salesperson. What if one powerful little book could take those objections and turn the skeptics into believers? The Four Year Career® by Richard Bliss Brooke is known throughout the Network Marketing community as the best “first look” for prospects … especially to build the belief of the skeptics. This compelling, generic, non-company specific, easy-to-read book is the single best recruiting tool you can use to open the door and invite prospects to just take a look. The Four Year Career® will also help you master the art of the invite! Special 10th Anniversary Edition . . . This special anniversary edition has been completely updated and rewritten to focus on the unique challenges of today’s network marketer. In addition it contain success stories of 10 of Shaklee’s best known leader teams, plus a FREE Shaklee Bookmark that highlights Shaklee’s long history, and a Shaklee Earnings Statement for you to share. 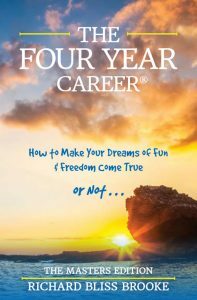 Laura Evans Interviews Richard Brooke on how to use the Four Year Career books. If you want to get the most out of the Four Year Career – Masters Edition books, watch this interview and learn exactly how Richard Brooke suggests using your copies. Senior Master Coordinator Laura Evans & Presidential Master Coordinator Roland Oosterhouse interview Richard Brooke on how to use the “Four Year Career – Masters Edition” book. If you’d like to customize your book to tell your own story, we’ve created templates to help. Choose from either the MS Word or Adobe Acrobat versions below. Simply change the text to a story about yourself, add your photo, and have it printed. Then you can insert your story along with the other inserts in the book. You’ll get some great ideas about what to include by reading through the 10 stories that are printed into the book. Note: In order to keep the story generic, we ask you to tell your story WITHOUT using Shaklee’s name in it. Right click on image to download. Click to open or right click to download. *Shipping costs, are actually “shipping & handling.” They include your envelope, postage, a full color Shaklee bookmark, AND a Shaklee earnings statement inserted into each book. You can expect your books within 5 to 10 business days. These prices are for United States shipping. Please click here to order books to ship to Canada. Each book includes a bookmark & earning statement. 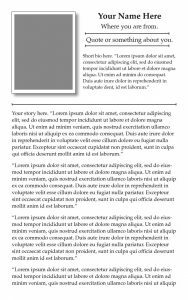 Click here to order extra bookmark sets for replacement.